“We are pleased to say we have controlled the spread of the epidemic,” Francois Fall, Foreign Minister, Guinea (14 April 2014). The latest outbreak of Ebola Zaire, which is ongoing, has now infected up to 200-persons and taken the lives of 121. Guinea has borne the brunt of the disease with 168 infections (108-deaths), Liberia 26 infections (13-deaths) and there are six suspected cases in Mali. These numbers are still likely to change. The World Health Organisation has a comprehensive update issued on the 14 April 2014. The Ebola across Africa infographic details the country specific outbreaks of the EVD since it was first discovered in 1976 (with a 1972 retrospective case from Zaire included). 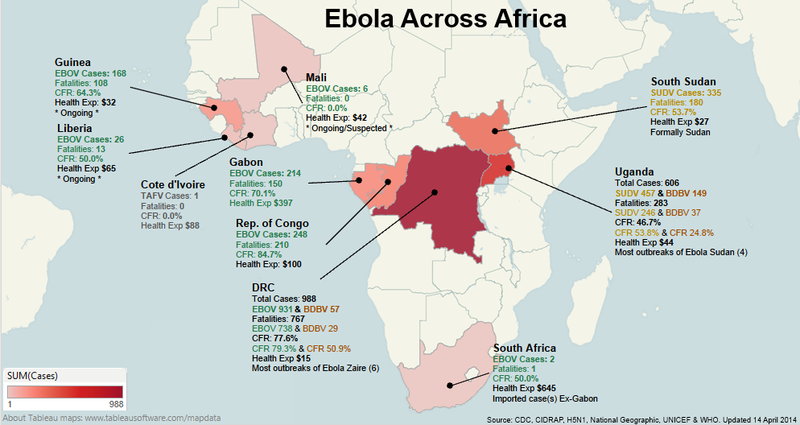 As the map shows the bulk of the outbreaks have occurred within central Africa and the most deadly variant, Ebola Zaire causing the most cases in the Democratic Republic of Congo (formally Zaire). Although the reasons are unclear the most recent outbreak has actually occurred in West Africa, originating from Guinea. As an additional point of interest I have also added the Health Expenditure per capita for each country in 2012 $USD (source: World Bank). Notes: The 1976 – 2004 outbreaks of Ebola Sudan occurred in the bottom half of Sudan (now South Sudan). Zaire was renamed the Democratic Republic of Congo in 1997. 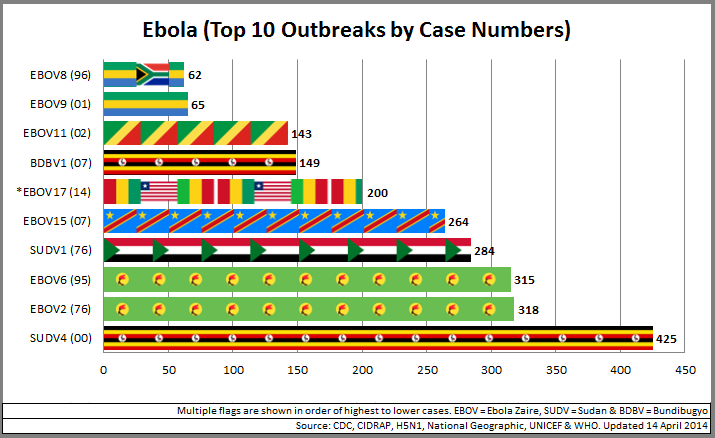 The next chart displays the top 10 outbreaks in order of case numbers and each horizontal bar is filled with the flag of the country where the outbreak occurred. With confirmed/suspected cases in Guinea (168), Liberia (26) and Mali (6) the EBOV17 coded outbreak has now become sixth largest based on case numbers. The largest outbreak (SUDV4) was of Ebola Sudan in Uganda (2000) when 425 became infected and 224 died. The only other recording of an EVD that jumped borders prior to this was in the 10th worst outbreak (EBOV8) when a doctor caught the disease in Gabon and subsequently caught an international flight to South Africa where he became ill and infected other health workers. Notes: In order from lowest to highest. 10th: EBOV8 (Gabon/South Africa), 9th: EBOV9 (Gabon), 8th: EBOV11 (Republic of Congo), 7th: BDBV01 (Uganda), 6th: EBOV17 (Guinea/Liberia/Mali), 5th: EBOV15 (Democratic Republic of Congo), 4th: SUDV1 (technically Sudan but would now be South Sudan), 3rd: EBOV6 (Zaire but now the DRC), 2nd: EBOV2 (Zaire but now the DRC) and 1st: SUDV4 (Uganda). 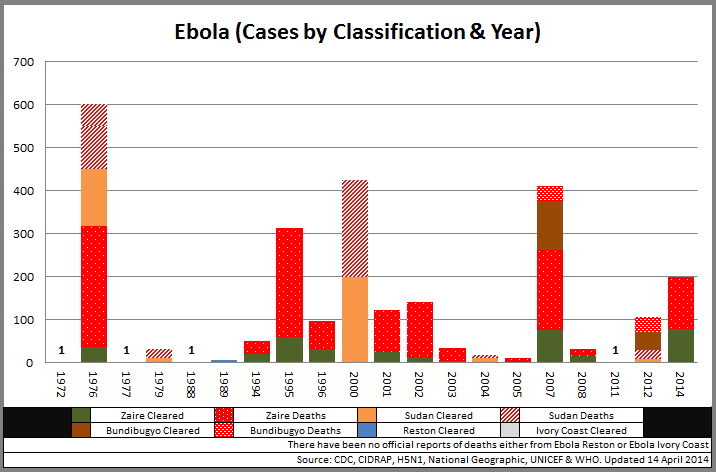 The final chart shows cases by classification (Ebola Zaire, Sudan, Bundibugyo, Reston and Ivory Coast) by year and then split into those recovered or those deceased (following in a red variant). As you can see the initial outbreak in 1976 of the both Ebola Zaire and Ebola Sudan was the most significant year with 603 cases and 431 deaths (a combined Case Fatality Rate of 71.5%). With up to 200 confirmed/suspected cases so far the 2014 Ebola Zaire outbreak is now the fifth worst in terms of case numbers. Notes: Several years had just one case. They are 1972 (a retrospective fatality of Ebola Zaire in Zaire), 1977 (a single case of Ebola Zaire in Zaire), 1988 (an accidental infection of Ebola Zaire in Porton Down, UK) and 2011 (a single fatality of Ebola Sudan in Uganda). The 2014 numbers are currently provisional. No specific treatment or vaccine is available for use in people or animals. Acknowledgements: Data for this infographic was sourced from official reports from the World Health Organisation. I have also utilised resources from the CDC, CIDRAP, H5N1, Virology Down Under and National Geographic.